The tile you choose for your pool can change its entire look! You have so many options when it comes to how you are going to design your backyard pool. Though you have a lot of decisions to make, you should have fun when creating the pool of your dreams. One of the things that you must decide is what type of tile you are going to install. Tile choice is important because it can really alter the look of your entire pool. 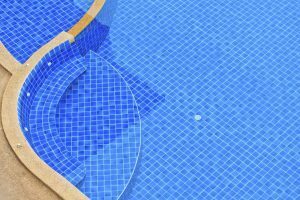 Here are a few common types of swimming pool tile to help make your decision easier. This is one of the more common types of swimming pool tile that you can choose from. That is because of the simplicity of installation. Along with easy installation, this tile does not require a lot of maintenance. All you have to do is clean them every so often to keep them looking fresh and new. Porcelain is soft to the touch so when you are swimming you don’t have to worry about leaning against rough edges when you want to take a break on the side. The downside to porcelain tile is that they are easily broken. If you are more into bold, bright colors, then mosaic tile is the best option for you. The versatility of this swimming pool tile is what attracts people to this type. Mosaic tiles come in a variety of different sizes, colors, and designs. You can use these tiles on the sides of the pool as well as the bottom to give the floor of your pool a unique look. If you decide to use this on the floor, just be sure to drain the pool every couple of years and thoroughly clean the tile to keep away algae and chemical build up. Glass tile is becoming a very popular choice among swimming pool tile. That is because the water bounces off it and creates an elegant look. Glass tile gives the illusion that your pool is a lot deeper than it really is. This tile comes in a variety of colors and designs as well. It is also one of the more durable options compared to the others, able to withstand a lot of use. It’s not difficult to install glass tile but it can be tedious. Stone adds an entirely different element and look to your pool. It gives your pool a very natural aesthetic which makes it comparable to swimming in a lake or pond. This natural appeal will make your pool a lot more relaxing and alluring. Stone is a porous material, so the downside is that the material can eventually begin to absorb the water. To avoid this, you should seal the stone every few years. You want to get a professional to install stone tile, as it is not an easy process. This entry was posted on Friday, March 9th, 2018 at 4:39 pm. Both comments and pings are currently closed.